Growing plants are the heart of every garden. They are the living element that surrounds your home with the good things of nature. No matter how big or small your garden is, it is the plants you grow in it that bring it to life, and of course you want them to grow well, to be healthy, and to thrive. Over time they will mature into specimens that are both beautiful and valuable, and a good garden adds between 5 and 13% to the resale value of your home – tens of thousands of dollars for a relatively small investment. When you plant, you also want to get the best value from your plants, and see your garden succeed and mature rapidly into something truly beautiful. In many cases that means taking a little time to give some attention and basic care to the new arrivals in your landscape – or perhaps to revive and encourage existing ones that are not doing so well. This is where some basic garden supplies are needed. Nothing fancy or gimmicky, just simple, well thought out products that will make the basic tasks of planting and establishing your plants much easier. And much more successful. 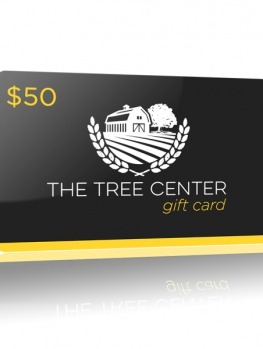 This is where the garden supplies we offer at The Tree Center come into play. We cover all the basics – providing support for your new trees; giving the soil and plants the best start in life; keeping your plants growing strongly; and giving water when you can’t – all vital needs of every growing plant. We have tracked down and tested the very best equipment and materials for you, so you can quickly access them when placing your order. You can confidently use these products, knowing the value they will be to your plants. You will see the vital contribution they make to creating a garden that is not only beautiful, but that also adds value to your property. Most of us are used to seeing newly-planted trees attached to a stake. Usually we think that stake is there to hold the tree up, to protect it from being broken in the wind, and to develop a straight, upright trunk. For a long time that was the goal of staking, but in recent years arborists – the experts on growing trees – have come to see that most of the things we did were wrong. They noticed how often staked trees would snap off just where the stake ended. They saw that when the stake was removed after a couple of years, the tree did not stand well, and was prone to breakage in the first storm that came along. They also saw how easy it was for the wires and ties to cut into the trunk as it grew, causing permanent ugly scars and damage. They asked why all this was happening – what were we doing wrong? Today we understand much more about how trees grow, and we have come to realize that trees have their own wisdom. They understand the old proverb that a tree that bends with the wind does not break, and it is the flexible young sapling that survives the storm. Young trees need to be able to bend in the wind, and absorb the force, before springing back. We also know from studies made, that trees exposed to that movement in the wind develop thicker and sturdier trunks, and that stems held rigid do not thicken. So once removed from a stake they are not strong enough to hold up the crown of the tree. Based on this understanding, tree staking has been revolutionized. No more the thick wooden stake tied tightly to the trunk. No more tight bindings, that damage the bark. Instead the goal when staking is not to hold up the trunk, but to stabilize the root-ball. What we have learned is that the root-ball needs to be held firmly in the ground, so that it does not move. When we plant our trees, we firm the soil around the roots, but that is often not enough. As the tiny new roots grow out into the surrounding soil, even a small movement will snap them, slowing down the vital establishment of our trees. It is the roots we must keep firm and immovable, not the trunk. When the wind blows, it is the roots of new trees that suffer, not their stems. Using this revolutionary approach, manufactures have developed several systems for staking, and our research led us to the ideal Tree Staking Kit. This simple but effective pack gives you everything you need to correctly stake a young tree. As well, this Kit is environmentally-conscious, and is made entirely from re-cycled materials. Aesthetically too, it is all-black, and disappears into the surrounding landscape – you want to see your tree, not the staking materials. Our Tree Staking Kit has three components. First is a broad woven strap that wraps around the stem without binding it tightly – never digging into the bark and scarring it for life. The strap wraps around the stem and creates three extension sections, each with a strong brass eyelet punched into it. Secondly there is sturdy, rot-proof polypropylene rope that quickly ties into those eyelets. The last component is three sturdy plastic stakes, just 15 inches long, that drive into the ground around your tree, leaning outwards. These have a strong crack-resistant top that makes it easy to drive them into the ground. The ropes attach to the stakes through pre-drilled holes, and they are pulled taut to hold your tree securely. The secret lies in placing the strap in the right place. It should be just a few inches above the ground, at the point where the trunk is just held upright. Find this by sliding your hand down the stem until the upper part begins to move a little. Usually this will be about 8 inches above the ground. When you tighten the ropes, the lower part of the trunk is held rigid, so that the root ball beneath the ground cannot move, to give you the quickest possible establishment of your new tree. The upper stem can bend, so that the trunk and crown grow in balance, the trunk thickening as the crown grows. After one or two seasons, once you see vigorous growth on your new tree, the roots are now securely anchored in the ground and you can remove the support. It is completely re-usable for another new tree planting. An easy, fool-proof way to stake your new tree, using the correct arborist’s guidelines. 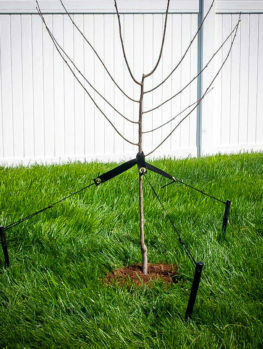 This simple kit makes correct tree staking easy and successful. Good soil preparation and enriching your soil with organic material to bring it to life is the key to the best long-term growth for your plants. But in the short-term, plants can always use a boost to encourage the best and strongest growth in the shortest time. Both when planting, and as your trees and shrubs develop through their early years, suitable fertilizer supplements are the key to quick establishment, to developing healthy soil, and to maintaining vigorous rates of growth. We researched and tested a wide variety of modern fertilizers, so you don’t have to, and we found the best products available, that give the very best results. We chose to go with organic sources – avoiding harsh chemical fertilizers in favor of natural materials that feed your plants and enhance your soil too. Knowing how often new gardens are planted on degraded, urban or new-development soil, we found products that add life to your soil in the form of natural bacteria and mycorrhizal fungi. We offer these natural and effective fertilizers for two stages of growth – starter fertilizers to get your plants and soil off to a flying start, and long-term gentle fertilizers to deliver optimal growth over a longer time-frame. When your new plants first go into the ground, they have only very limited access to the natural fertilizers in the surrounding soil, since the roots have not yet developed. So when planting, the right thing to do is to give them some gentle nutrients that are readily available to them. Just as important is to nurture the soil, so that natural soil cycles are restored to degraded earth. As well, water-stress can easily occur, especially in poor and sandy soil, so water conservation is important too. DIEHARD™ Transplant Starter Fertilizer does all these things. It contains multiple ingredients to give your plants the best possible start in life. First, DIEHARD™ Transplant contains kelp meal. This dried and ground seaweed, harvested from the oceans, has been known for centuries as the ideal soil additive. It binds with the clay in your soil, clumping the tiny particles together to improve drainage, also opening their chemical structure so that trapped nutrients are released. As well, it decomposes gradually, releasing a steady supply of minerals for your new plants. This remarkable product also contains mycorrhizal fungi. These amazing organisms bind to the roots of plants and help them absorb nutrients from the soil, as well as providing key elements directly to the tree. Your soil also need feeding, and a blend of beneficial bacteria in our Starter Fertilizer conditions the soil, creating a nurturing environment that liberates nutrients from the soil reserves, and re-cycling organic material in the soil. Root diseases can attack newly-planted trees and shrubs, so DIEHARD™ Transplant Starter Fertilizer contains unique Trichoderma fungi that prevent the growth of harmful root diseases in the soil. This fungus has been used for decades in the nursery industry, to protect plants in container production, and now you can use their ‘trade secret’ in your own garden too. Finally, to increase the water content in the soil around those tender new roots, and to prevent transplant-shock from sudden, unexpected dryness, there is Horta-Sorb® Gel, a unique, patented product that holds water, only releasing it when the soil is dry. This is your insurance against a sudden dry spell, or simply forgetting to water. 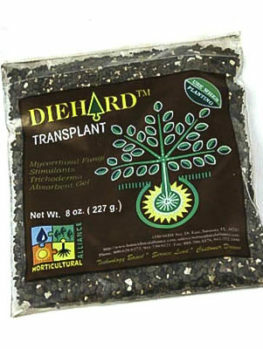 Taken together, these components make DIEHARD™ Transplant Starter Fertilizer the perfect soil additive when planting new trees and shrubs in your garden. As well, we recommended for degraded soils, such as new developments, where the natural soil profile has been destroyed by construction, and for all soils with low fertility, Bio-tone® Starter Plus. If you a starting a new garden, or planting on poor soil, this is the material to use. We are amazed at the quality of this product, and of the extensive research & development that has gone into its creation. – A blend of natural materials that act as slow-release fertilizers, giving a steady flow of the three basic plant nutrients, plus all necessary micro-nutrients. 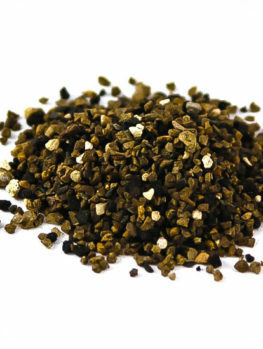 This blend contains feather meal, bone meal and alfalfa meal – natural sources of nutrients widely used by organic growers and known for their gentleness and broad-spectrum nutrient balance. – Two components – greensand and humates – that bind soil particles to make your soil simultaneously more water-retaining and yet better drained. – Natural sources of potassium and magnesium are also added, to maintain optimum levels of these vital nutrients. – A blend of three bacteria selected for their ability to breakdown organic nutrient sources into available minerals, and to provide disease protection by coating the roots of your new trees. – Mycorrhizal fungi complete Bio-tone® Starter Plus, to help young trees absorb and utilize nutrients more effectively, especially in poor soils. Once your plants are growing, they will benefit from an on-going fertilizer program. Perhaps you have plants in your garden that are not doing well, and they too will benefit from additional nutrients. 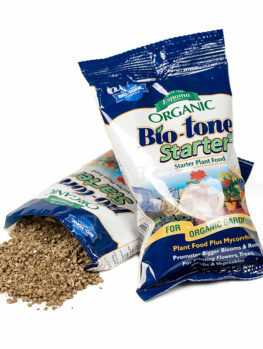 At The Tree Center we highly recommend Bio-tone® Fertilizers. These have all the benefits and components of Bio-tone® Starter Plus, but with higher nutrient levels tailored for larger plants. These can be used as soon as your new plants are established, and for as long as you want to achieve maximum growth and development. They enhance growth rates, increase flowering and fruiting, and they also stimulating healthy soil cycles, creating sound ecological conditions in your soil. 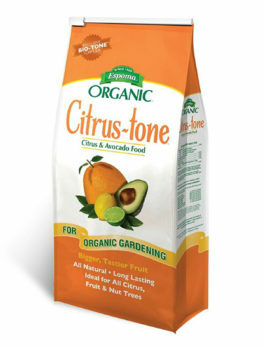 Use Bio-tone® Citrus Tone for citrus trees and other fruiting plants, particularly in warmer parts of the country and for all your trees and shrubs growing in containers. Use Bio-tone® Holly Tone for all broad-leaf evergreens, including acid-loving plants such as azalea and rhododendron. Use Bio-tone® Tree Tone for all your trees and deciduous shrubs anywhere in the garden. Most newly-planted trees and shrubs survive and flourish, but some initial care is needed, and when newly planted trees die, drought is the most common reason. Maintaining a steady water supply during the establishment phase is very important, and so we have researched to find a product that will help our customers in this vital stage. We found it in the Treegator® Jr Slow-release Watering Bag. The single largest problem with watering trees and shrubs is making sure that the water deeply penetrates the ground, and doesn’t simply run off, or wets only the top couple of inches. Failure to water deeply means that the root-ball remains dry, and it may even – especially in newly-planted trees – dry so much that the foliage wilts, and the leaves yellow and fall, while the surface soil appears damp. This may even lead to the death of your new tree. Standing with a hose for several hours, gently watering each tree in your garden one after the other, is not a viable option for anyone. This is where the Treegator® Jr Slow-release Watering Bag comes into the picture. The Treegator® Jr is a donut-shaped plastic bag, in a muted gray-brown color, which sits around the trunk of your tree or shrub. It will fit around any kind of tree – single-trunk, multi-stem, or shrub, including plants with foliage right to the ground. On the undersurface are two gentle water emitters, that slowly release water onto the ground over a 5 to 9-hour period, which is plenty of time for the water to penetrate deeply and completely, into any kind of soil. Since the water is released underneath the bag, nothing is lost to evaporation, as happens using a sprinkler, and the bag itself helps the water flow evenly over the entire root zone. You use the minimum amount of water for the maximum benefit. When water restrictions are in place, and sprinklers are banned, you can still water your trees and keep them healthy. The Treegator® Jr takes moments to put in place. Its 36-inch diameter circular form covers the root-zone completely, for both new and established plants. It takes less than 5 minutes to fill the bag, so in just half-an-hour you can water six trees – equivalent to 50 hours of hand-watering. Once the water has drained away the bag acts as mulch, conserving water and keeping the ground cool, which in turn encourages rapid and healthy root growth. Simple re-fill the bag once or twice a week, and your watering issues are solved. Your trees will never lack for water, and you will have lots of time for the rest of your life. You can plant your garden without fearing it will take more time to care for than you have available, and you will be growing your trees under ideal conditions. 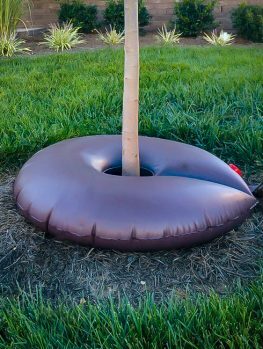 The Treegator® Jr Slow-release Watering Bag is the perfect way to water new or established plants in the minimum time, and we highly recommend you install one around each new tree you plant. You won’t regret it when you see the healthy, stress-free establishment of your plants that is the result of using this ingenious system.